U.S. Secretary of Defense Leon Panetta, left, and Secretary of Veterans Affairs Eric Shinseki testify before the House Armed Services Committee and House Veterans' Affairs Committee on July 25, 2012 in Washington, D.C. The system designed to assist service members transitioning from active duty to civilian life is "overwhelmed," Secretary of Defense Leon Panetta told legislators in a historic Congressional hearing on Wednesday. 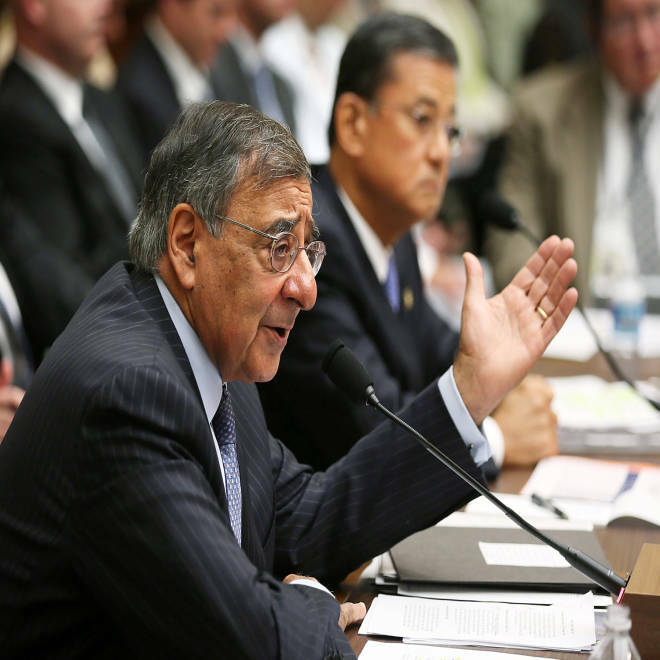 The hearing, in which Panetta and Secretary of Veterans Affairs Eric Shinseki testified about both departments' capabilities to successfully transition service members, was the first time both the House Armed Services and Veterans’ Affairs committees met jointly. Among legislators' concerns were VA's claims backlog, the lengthy wait for active-duty wounded warriors to secure disability retirement and the effectiveness of the Transition Assistance Program (TAP), which is meant to help service members plan for a post-military career and better understand their benefits. "The reality is that not all (service members) are getting the kind of care and benefits they should get," Panetta said. The expected draw down of at least 80,000 soldiers in the coming year will strain transition services as well, he said. "This system is going to be overwhelmed — it's already overwhelmed." If the Department of Defense is subject to sequestration cuts as part of across-the-board deficit reduction, the Army may have to trim its forces by an additional 80,000 to 100,000 service members. The president has promised that VA would be exempt from sequestration, but Shinseki told legislators that the exemption might not cover administrative costs. "We all know there is a surge of veterans returning home, and it has become apparent that DoD and VA are straining to meet the challenge of providing a successful transition for these men and women," Rep. Jeff Miller, R-Fla., chairman of the House Committee on Veterans’ Affairs, told NBC News. In the past four years, Miller said, the claims backlog has ballooned and wait times for appointments, particularly for combat-related psychological disorders, have extended into months. In addition, a single electronic medical record that could be used between VA and DOD remains five years away. As of July 21, more than 915,000 claims were pending with the VA, two-thirds of which have been in process for more than 125 days. Shinseki testified that the backlog was due in part to recent decisions to award claims in three new categories -- Vietnam-era Agent Orange illness, post-traumatic stress disorder and Gulf War illnesses. In his written testimony, Shinseki said that VA plans to eliminate the backlog in 2015 with a goal of processing all claims within 125 days. Injured or wounded service members who want to medically retire from the military, which would grant them full medical benefits and monthly compensation, also face long delays. As of May 2012, more than 26,000 service members had open cases; in the Army, where service members wait the longest, claims were processed in average of 427 days. That includes time spent for rehabilitation and medical care, Shinseki said, but both departments were tasked by Congress with expediting and streamlining the disability retirement system several years ago, and the goal for processing cases is 295 days. Panetta said that as the two bureaucracies work together in unprecedented ways to improve the transition process for service members, there still remains a "lot of built in resistance to adapting and changing the way we do things." "Things are going to have to change," he said. Rebecca Ruiz is a reporter at NBC News. Follow her on Twitter here.